We’re sure you’ll fall in love at first sight with Acres of Lake Gibson! Located in North Lakeland, Acres of Lake Gibson is a lovely community with beautiful, aged oak trees and near beautiful Lake Gibson. Acres of Lake Gibson is conveniently located to Lakeland Regional Health, Tiger Town Baseball Stadium, Sandpiper Golf Course, close to HWY 98 and I-4, making commuting easier, and all of the shopping and dining North Lakeland has to offer. Padgett Elementary, Lake Gibson Middle and Lake Gibson Senior High Schools are also nearby Acres of Lake Gibson. 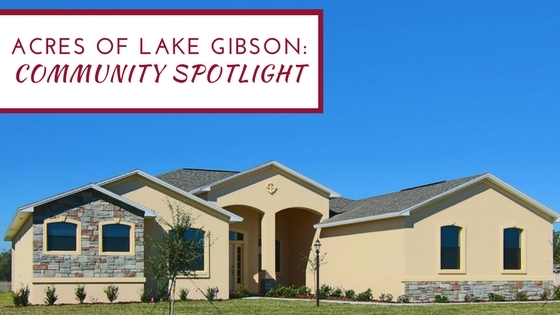 Acres of Lake Gibson homeowners can choose from 20 different floorplans and a range of elevation styles. Each home is on an extra-large lot and ranges in size from 1,450-2,205 square feet, three to four bedrooms and two to three bathrooms. Enjoy open layouts in the main living area, patio/lanai space, spacious owner’s suites and generous guest rooms. Visit our website to find out more information about Acres of Lake Gibson. We invite you to view our available floorplans, current site plan and sign up for interest list today. Interested in our other Polk County new home communities? View more homes for sale throughout Polk County online.